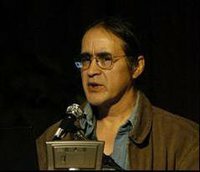 Orville Huntington is a wildlife biologist, hunter, and community leader, living in the remote Athabascan community of Huslia. While preferring to stay home with “my girls” (his two daughters) he has served on the Alaskan Native Science Commission. …Orville Huntington is presently the Chair of the Interior Athabascan Tribal College. He also currently is serving as the Interior Villages Representative on the Alaska Federation of Natives Board for the 43 villages in the Doyon area, and makes his home in the Athabascan community of Huslia, a village in the Yukon-Koyukuk region of Alaska. Orville works exclusively with professors, non-profit organizations, and colleges regarding the issue of “Climate Change Impacts and the Sustainability of Rural Communities.” He also uses and continues to develop the Native American Traditional Ecological Knowledge database. His research interests are the direct and indirect impacts of subsistence use on fish, animals, and plants of northern ecosystems; the evaluation of currently policy and regulations and their affects on the subsistence methods and means of harvesting fish, wildlife, and plants. Orville is also committed to education and outreach projects that help non-Alaskans understand the culture and subsistence lifestyle of his people. This entry was posted in Make No Bones Shows and tagged Arctic-Climate Change, Athabascan, Honoring, Indigenous, Make No Bones About It, Native American Indian, Natives Board, Orville H. Huntington, Raven Redbone, Tribal Perspectives. Bookmark the permalink.